President-elect Viktor Yushchenko isn't waiting for substantive action from the West. Instead, the President-elect, a courageous pragmatist, has called for peaceful civil disobedience. Because of it the world is starting to listen. In addition, he is shrewdly asking the army and local police for support. Outgoing president Kuchma is no doubt feeling the resistenace of those he once directed to terrorize political opponents. Surprisingly, he's calling for the two presidential candidates to negotiate. It may suggest that Kuchma no longer has the support or control over the military and law enforcement. Ultimately, those in uniform will determine whether President-elect Yushchenko is allowed to move Ukraine in a new, vital, and self-determined manner. The mass demonstrations under the watchful eye of Moscow overlords show that Ukrainian national consciousness has taken root. There is no turning back. It is evidence of a confident people proudly walking into the future without foreign, self-serving paternalism. This is the new reality that Russian President Vladimir Putin, a former KGB agent, must embrace. Huge protests in Kyiv underscores the maturity of a nation that has struggled for too long under the yoke of foreign influence, occupation, and exploitation. Ukrainians in a post-Soviet age feel empowered. The question, however, remains: What can Ukrainians in the Diaspora do? Diaspora Ukrainians can continue to lend their voices to the public debate in their respective countries and get heard in Ukraine. freedom and development of his reason." Ukraine is poised for a "velvet" Revolution, a peaceful overthrow of a regime that does not serve the greater good of its citizens. The information age enables all of us to email, write, and offer direct moral support to the President-elect and those who are risking their lives to protest. Consider contacting Ukrainian embassies, sending emails, or submitting letters to the editor to papers in Ukraine or websites like this one where they can be read by the world. Brave patriots participating in mass rallies are probably not expecting much from other nations right now. Powerful democratic nations have often ignored their plight. Need anyone remember the Tsars or the 1933 Famine? Sustained peaceful protests,however, is changing that complacency. Even the White House, which has not always been attentive to Ukraine, has finally issued strong concerns about Moscow's involvement and the obvious fraudulent election results. It's critical that those patriots on the frontlines of liberty, the streets of Kyiv, have as much moral support as possible. These brave men and women of all ages should not think they're alone. In that regard we can make a small, yet important contribution to supporting them and President-elect Yushchenko. You can make a difference by emailing, calling federal lawmakers, or writing letters of support to Ukrainian publications here and abroad. Let the patriots know that their efforts are not in vain and that the world is listening. Act today. Time is of the essence. 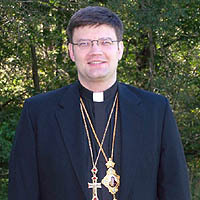 Bishop Paul Peter Jesep serves as Vicar General of Government Relations and Public Affairs for the Ukrainian Autocephalous Orthodox Church-Sobornopravna of Europe and the Americas. His Grace, originally trained as a lawyer and political scientist, once served as an aide to U.S. Senator Susan Collins (R-ME). He has studied at Bangor Theological Seminary in Maine (bts.org).